A simple and colourful salad with creamy feta. 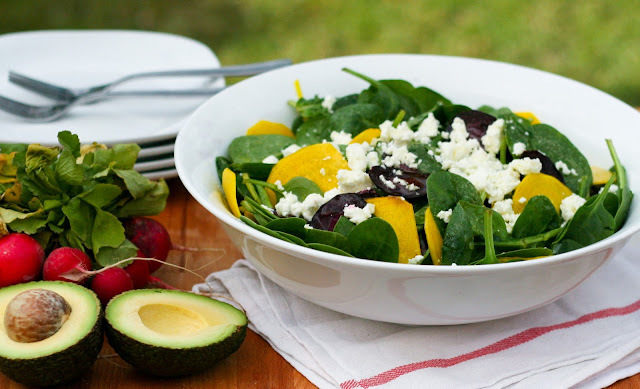 Only 4 main ingredients for this delicious baby spinach, golden beet & feta salad. Golden beets are super sweet and even better if you can find the baby ones. I have also used purple carrots to add some colour but the usual orange carrots would work too. The creaminess of the feta and sweet crunch of the thinly sliced beets and carrots make a delicious combination. Any other additions you have on hand like avocado would also be lovely and thinly sliced radish if you wanted to add some extra colours. I love eating a rainbow of veggies, a balance of greens and various colours not only looks good but with each colour group having their own unique beneficial properties.